The first time I missed Ronnie James Dio was on 22 August 1980. My long-lost buddy Philip and I had tickets to see the “Black and Blue” tour featuring co-headliners Black Sabbath and Blue Öyster Cult at the Bonneville Raceway, located just outside Salt Lake City and not to be confused with the nearby Bonneville Salt Flats of land speed records fame. Black Sabbath with new singer Ronnie James was touring the group’s first post-Ozzy album Heaven and Hell while BÖC was promoting the also recently-released Cultösaurus Erectus. I had gotten both releases on cassette and thought them outstanding. I had seen a few other excellent shows in that year of my live music cherry-popping – to include The Who and Robin Trower – but the Black and Blue tour was set to be my first gig attendance based on pre-existing love of the performing groups and their then current songs. I could not have been more excited as we pulled into the parking area in Philip’s souped-up Ford Ranchero with stereo blaring. Having chosen to play my cassettes to set the mood for the show vice listening to the radio during the hour-long drive to the venue, we had no idea in those pre-internet days that Black Sabbath had cancelled their Salt Lake City stop until we arrived at the raceway and heard murmuring from our fellow concert-goers. The gossip that night was that Sabbath drummer Bill Ward had overdosed on something the previous day and therefore the Sabs could not go on. Official histories belie the OD story but do indicate that Ward was plagued with drug problems and had left the band to go into rehab following a show just three nights before in Los Angeles. 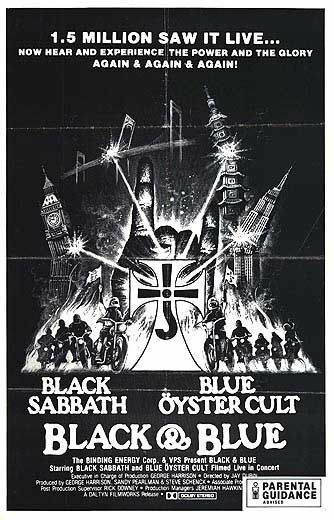 Black Sabbath ended up missing only 2-3 shows before inserting drummer Vinny Appice into the line-up to continue the tour. (They would also subsequently record the band’s next album, Mob Rules, with Appice behind the kit). Talk about fickle fate; had Ward’s drug-addled departure occurred just one week earlier or later, I’d have witnessed Sabbath’s live glory. At the time I couldn’t help but wonder whether it was all a conspiracy by town elders and angels to rob us Mormon kids of a little netherworld stimulus. While bummed over Sabbath’s no-show, I became a life-long super fan of BÖC that night when they came out following a short set by the unremarkable opening band — the all-but-forgotten French hard rockers Shakin’ Street — and announced that they would lengthen their performance to make up for their co-headliner’s absence. Ignoring strong winds and blowing sand at the outdoor desert venue, the Öysters proceeded to play a blistering extended show, offering up two full sets broken up by a short intermission. The first set incorporated multiple cracking new songs from Cultösaurus Erectus, plus fan favorites “Godzilla,” “(Don’t Fear) The Reaper,” “Cities on Flame,” and “ME 262,” among many others. Apologizing for non-existent deficiencies resulting from a lack of rehearsal, singer Eric Bloom then introduced a second set that included inter alia my personal faves “Then Came the Last Days of May” and “Transmaniacon MC,” as well as a cover of the Beatles’ “I Want You (She’s So Heavy).” The ad hoc nature of the second set was proven as the band appeared to decide what to play on the fly, with Bloom offering up long explanations of where individual songs came from and how long it had been since they’d been regularly played live. My BÖC dedication continues to this day; I type this just two weeks before planned attendance at a 31 January 2015 show by the band’s current incarnation — which includes only Bloom and guitarist extraordinaire Buck Dharma from the 1980 line-up — at the tiny Tally Ho Theater in Leesburg, Virginia. I can’t wait! My next successful missing of Ronnie James followed a few months later, although this time I was actually years behind the curve as opposed to the few days of the “Black and Blue” miscarriage of cosmic justice. I saw the band Rainbow at Salt Lake City’s Salt Palace on 29 March 1981 on a bill that also included the Pat Travers Band (from which, on theme, co-lead guitarist Pat Thrall sadly had departed a few months prior). While Rainbow was touring on the back of their then-new album Difficult to Cure, which boasted the talents of vocalist Joe Lynn Turner, the only Rainbow LP I owned at the time was a used copy picked up on the cheap from the Deseret Industries Thrift Store of the live double album On Stage, which had been recorded in 1976 when Ronnie James was in the band. Rainbow played only three Dio-era songs during the concert I saw, but I was pleased that two of them, “Man on the Silver Mountain” and “Catch the Rainbow,” also appeared on On Stage. In hindsight, I wish I could say I spent the evening pining for Dio’s honeyed tones, but the truth is I was there to see guitar hero Ritchie Blackmore and was relatively unconcerned about who accompanied him. I do remember being impressed with Turner and a couple of solos played by keyboardist Don Airey — whose name meant nothing to me at the time — but for the most part my attention was firmly on the guitar god at right side of the stage. He was dressed in black and seemed moody that night, thus awesomely living up to his legend. I am somewhat embarrassed to admit complete obliviousness to the presence of then former Deep Purple bassist Roger Glover, although I vaguely remember a bass solo. 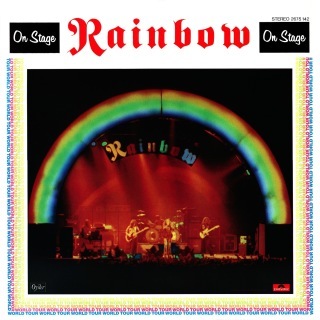 Besides the Dio-era tunes, highlights of what I recall as a too-short set by Rainbow included a cover of Jimi Hendrix’s “Fire,” an extended encore performance of Purple’s “Smoke on the Water,” and the instrumental workout “Difficult to Cure,” Blackmore’s cranked-up take on Beethoven’s Ninth Symphony. The whole show was fantastic, although as it turned out I think I actually came away slightly more impressed by Pat Travers and company. I undeniably ignored the importance of Ronnie James to Rainbow during my enjoyment of that 1981 show, although I would note in my defense that I subsequently owned all the Dio-era Rainbow albums at least a decade before adding any of the band’s post-Dio recordings to my stacks. An aside for an obligatory full-disclosure disclaimer: I do not mind — and could even be correctly described as “liking” — Blackmore’s Night, Ritchie’s current Renaissance Fair-style medieval folk rock outfit with his multi-instrumentalist/vocalist spouse Candace Night. 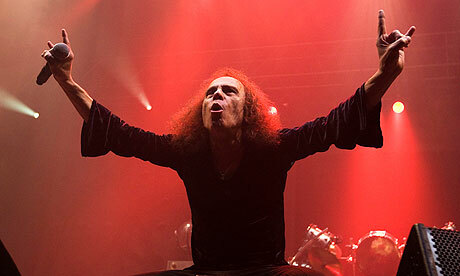 It would be another 28 years before my third “missing” of Ronnie James Dio. On 1 August 2009, my son and I saw Big Elf, Zappa Plays Zappa, Queensrÿche, and Dream Theater at Merriweather Post Pavilion in Columbia, Maryland. It was to be my last show with my boy before our lives would evolve considerably with him heading off to college and my departing for a one-year unaccompanied (i.e. without family) assignment in Afghanistan. The concert was fantastic and we were hyped as we walked back to the car afterwards to find under the windshield wiper a flyer for an upcoming show featuring Maryland’s own Kix opening for Judas Priest and the Dio-fronted version of Black Sabbath reunited under the legally-allowable moniker Heaven & Hell. Much to our chagrin however, the concert was to occur on 22 August, roughly two weeks after my scheduled departure for South Asia. Lamenting the bad luck on timing, we consoled ourselves with the knowledge that there would certainly be future opportunities to see Heaven & Hell following my return home in August 2010. Cold fate intervened however as Ronnie James Dio succumbed to cancer — a truly uncaring, undifferentiating satanic evil — on 6 May 2010, dooming all of us to miss him continually forevermore. So, in the end, drugs, creative differences, terrorism, and death all contrived together for the sole purpose of blocking me, VotF, personally from ever experiencing the glory of Ronnie James Dio live. How freaking rock and roll is that?!? As for Bill, I knew he had drug issues at that time (that’s documented) but I didn’t know about the OD. So basically, you missed them right at they were changing drummers? Yeah, just my luck, eh? A quick internet search suggests us in Salt Lake and fellow poor buggers in Denver ended up the dumb-luck losers from Mr. Ward’s thoughtlessness. As for the “overdose,” that was the telephone tag story being told among the Utah concert-goers that night. Whether it was an actual OD or just general druggedoutedness, I can’t claim any firsthand knowledge. Really enjoyed this post, as always. Remind me never to go see any variation of Black Sabbath with you! I’m feeling a bit guilty… I’ve seen Dio four times! But I’ve never seen Blackmore (my favorite guitarist) or BOC so maybe that makes up for it? Unless your secret identity is Bill Ward or you have unexercised superpowers to reverse cancer, no need for guilt. I mean, I temporarily hate you a little of course, but hey man, this is the internet so it’s all good! I feel even guiltier than HMO, I’ve seen Dio five times and it would have been a 6th at 2010 Bloodstock Festival if tragedy hadn’t struck. It’s little consolation for you but I’ve never seen BOC and I do feel a bit sad about that. Ok, five times is a little over the top what with folks like me going without. Gluttony is one of the seven deadly sins, you know. Nurture that nascent BÖC sadness though; nothing like a tiny twinge of mitigating reciprocal feeling of superiority to salve my emotional wound. A story of misses. The breaking news, Sabs, Pat Thrall, everybody but bored Blackmore, a son and home… But at least you saw Queensrÿche. You are right, Sir… at least I saw Queensrÿche! Change the perspective, change the view (smile).